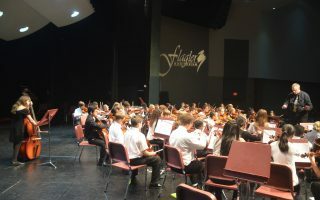 The Flagler Youth Orchestra performs its third concert of the 2016-17 season on Monday, May 1st, at 7 p.m. at the Flagler Auditorium in Palm Coast. Conductor Sue Cryan and fellow teachers of the FYO will lead five orchestras with nearly 350 string musicians — a cross-section of public, private and homeschooled students. The program includes movie music from Sherlock Holmes, Pirates of the Caribbean, and Cinema Paradiso, as well as a special collaboration with members of the Flagler-Palm Coast High School band.